Reading Comprehension as Community Service! Author Margaret BlackPublished on November 4, 2013 March 30, 2014 Leave a comment on Reading Comprehension as Community Service! This project fulfills curriculum expectations in reading and science, while helping a local wildlife sanctuary! 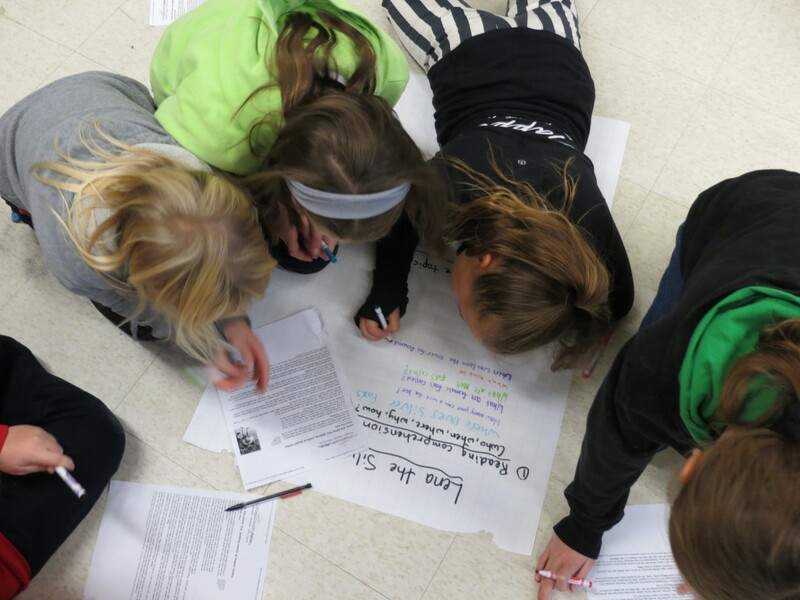 This week, students brainstormed reading comprehension questions and discussion/debate topics that touch on the "big ideas" in a series of educational articles, authored by staff and volunteers at Aspen Valley Wildlife Sanctuary. 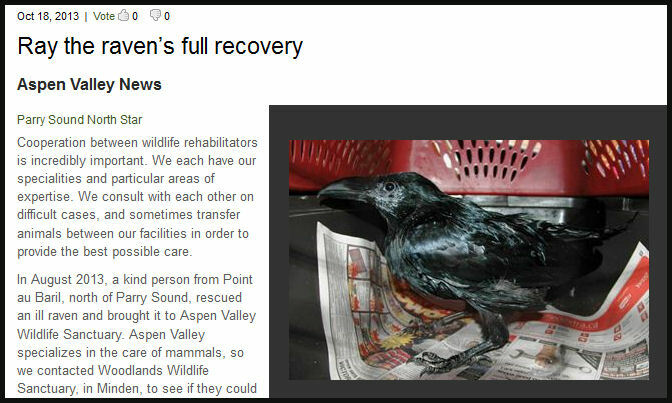 We started the project by reading an article, that was projected on the Smart Board, about a Raven that was successfully rehabilitated and released, through a cooperative effort between Aspen Valley (Rosseau) and Woodlands Wildlife Sanctuary (Minden). 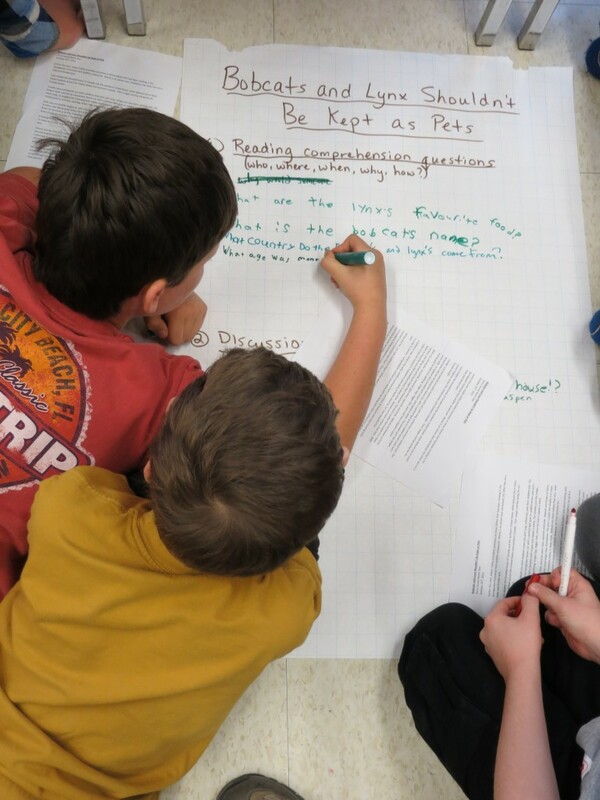 Then we worked together to brainstorm questions to accompany the article. 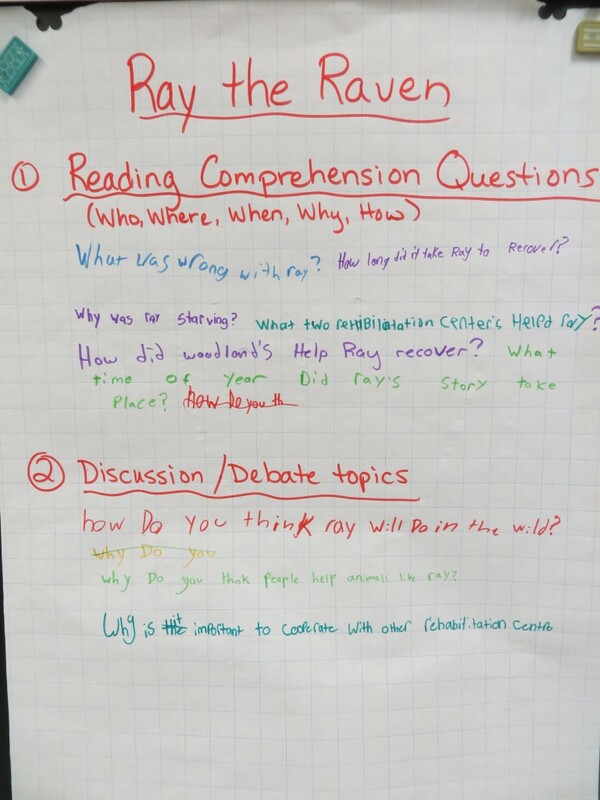 Students have discovered that it takes as much skill and effort to formulate good questions as it does to answer them. Even so, they are enjoying the opportunity to take on the role of educators. A retired school teacher who conducts school tours at the sanctuary and I will be compiling the class' ideas. 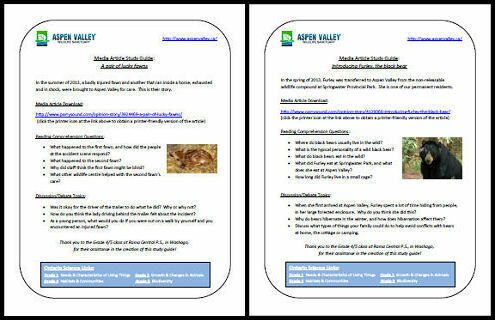 Then, finished study guides for twelve newspaper articles will be uploaded to the Aspen Valley Wildlife Sanctuary website, as free resources for teachers to use with their students. These are the results of our brainstorming sessions. 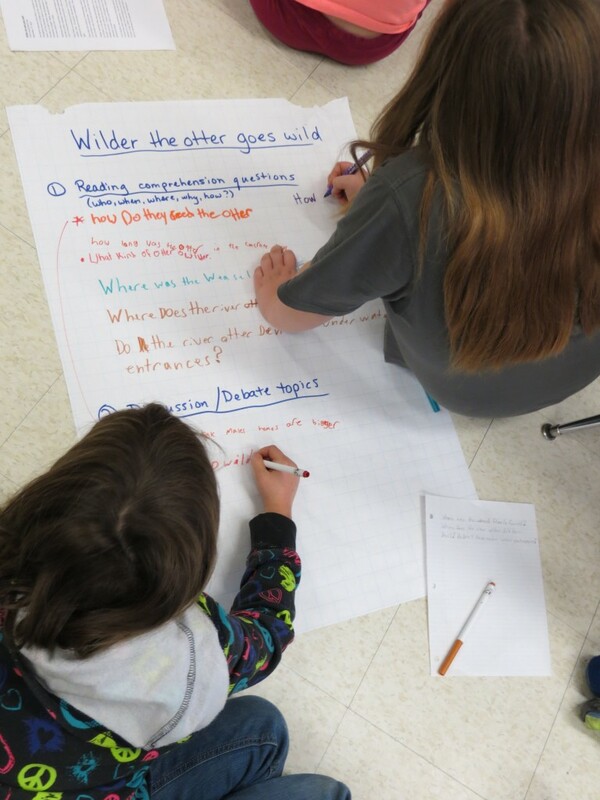 The first picture shows the class' reading comprehension questions and discussion/debate topics about articles having to do with wildlife rehabilitation. The second picture shows their notes re: articles about permanent residents. The finished products are now available for free download on the Aspen Valley Wildlife Sanctuary website! 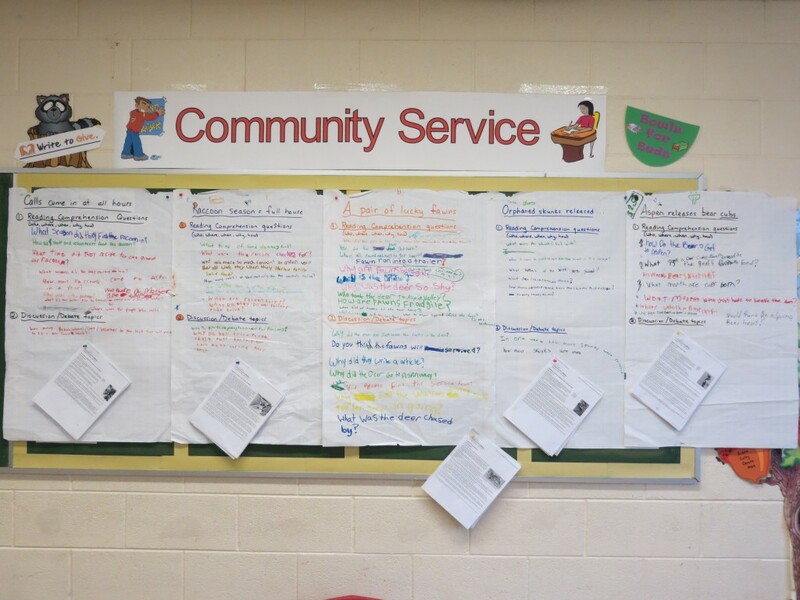 Published on November 4, 2013 March 30, 2014 Categories Community Service, Language, ScienceLeave a comment on Reading Comprehension as Community Service! Collecting over 200 lbs. 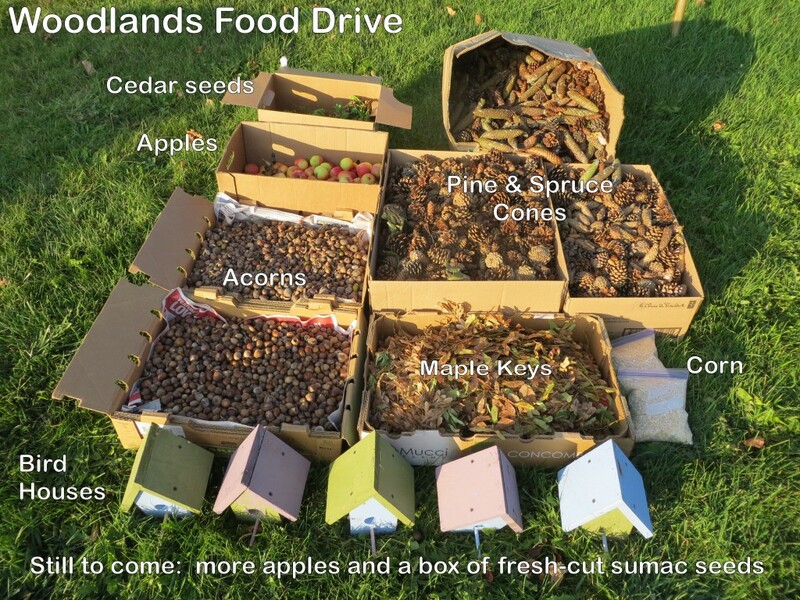 of acorns, pine cones and maple keys, to help feed overwintering baby animals at two local wildlife rehabilitation centres. Providing moral support to a charity working to improve the living conditions of captive animals. 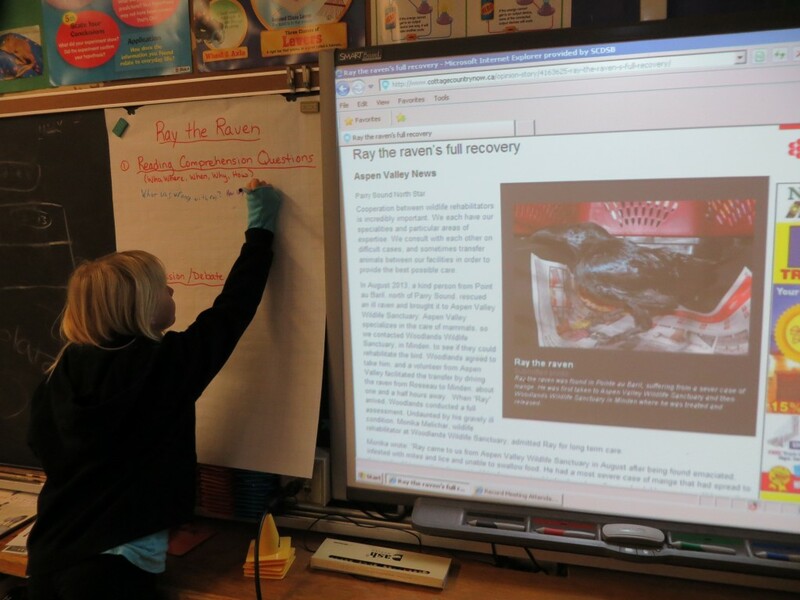 Developing study guides for newspaper articles educating the public about wild animals. Providing moral support to an eight year old girl at another school, who is gravely ill.
Raising funds in support of two local animal welfare organizations. Painting bowls to assist a local charity in supporting homeless people. Assisting local residents experiencing spring flooding, by filling sand bags at the public works yard. 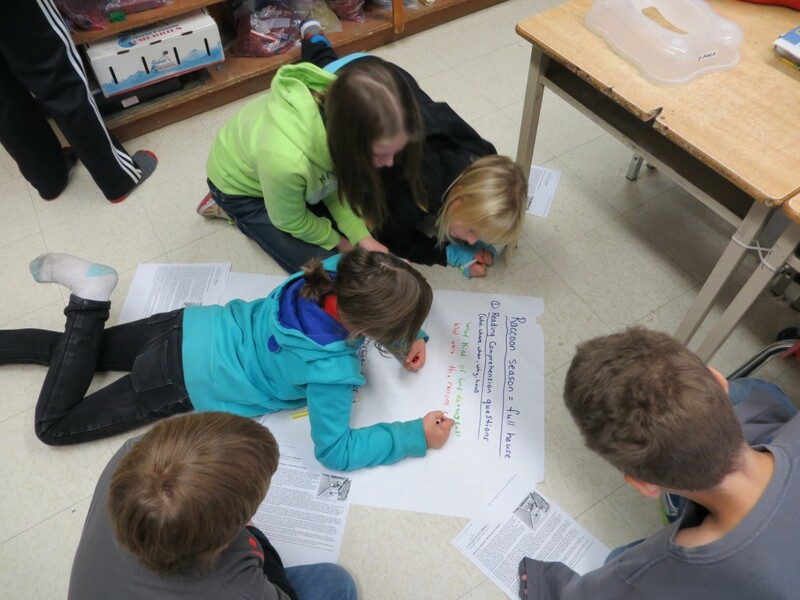 Writing persuasive letters encouraging companies to support the Kawartha Turtle Trauma Centre. Natural foods from the environment provide appropriate nutrition for baby animals. Orphaned baby animals overwintering at wildlife rehabilitation centres also need to be fed what they will eat in the wild, so they know what to look for after they are released. At the end of the food drive, the class estimated the number of acorns, pine cones and maple keys they had collected, by applying math concepts, including weight and volume calcuations, multiplication, rounding and estimation. They also graphed the number and weight of items collected. Using food consumption data provided by a wildlife rehabilitator, students calculated how long their food drive items would last, if fed to the 40 baby squirrels overwintering at two local wildlife rehabilitation centres. 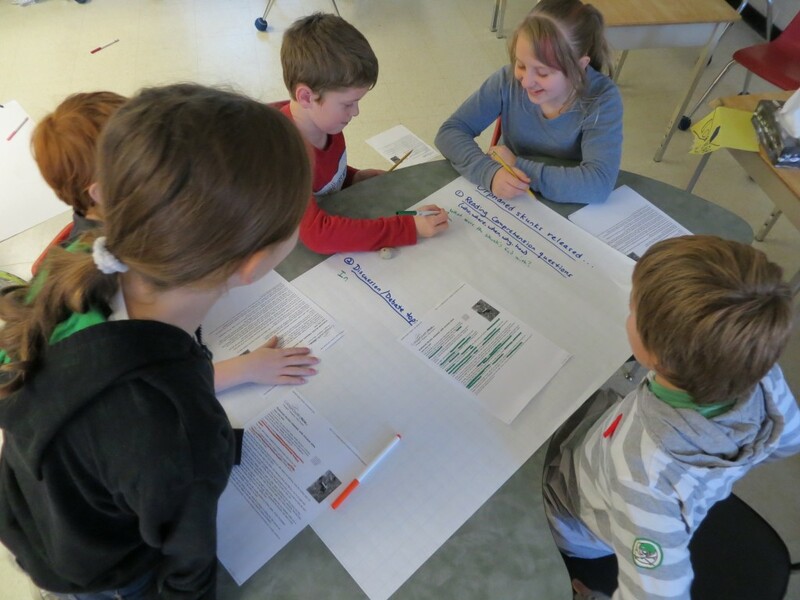 This project grew out of a math lesson in which Grade 4 students were asked to compare the weights of a number of large animals. 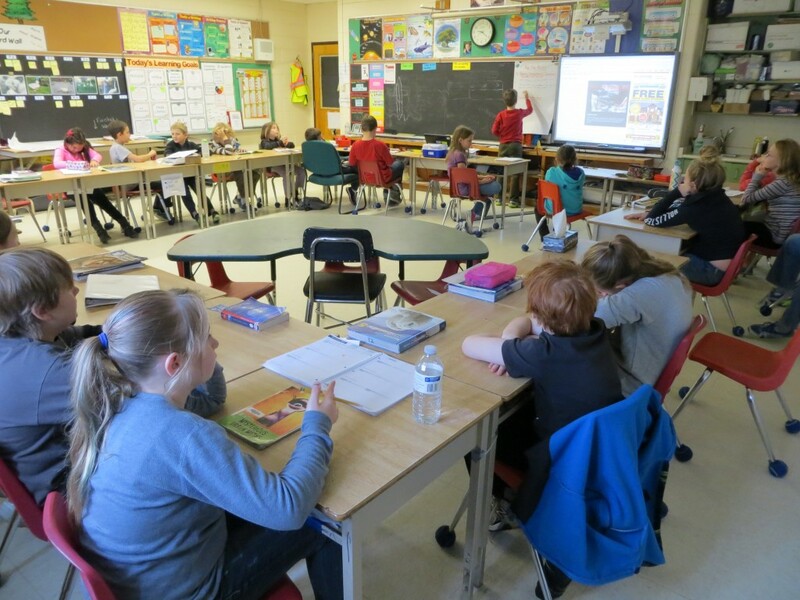 A discussion of the Nelson Math worksheet accompanying the lesson grew into a discussion of the impending transfer of the Toronto Zoo elephants to a sanctuary in California. 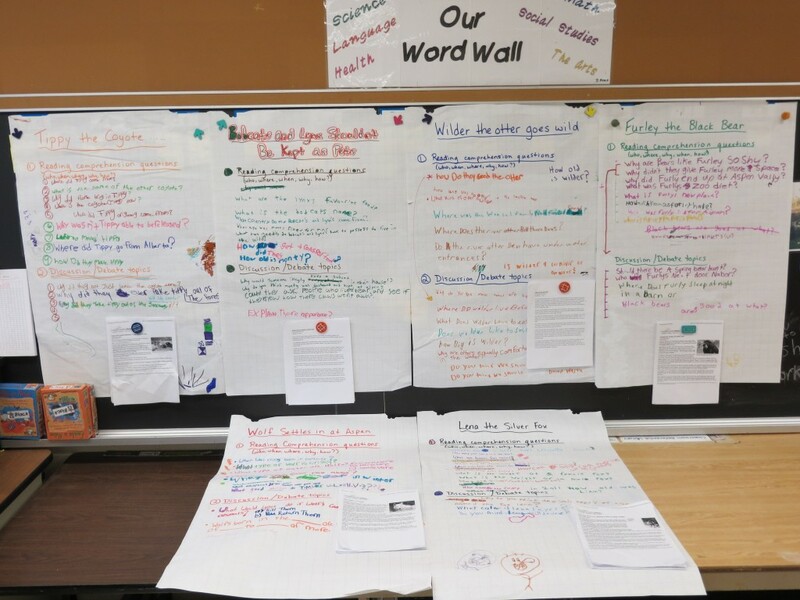 From there, the project became a written language project, with students creating cards and letters demonstrating their support for the elephants and for the people organizing move, and an art project in which students worked collaboratively to create an "elephant-sized" mural for the classroom. 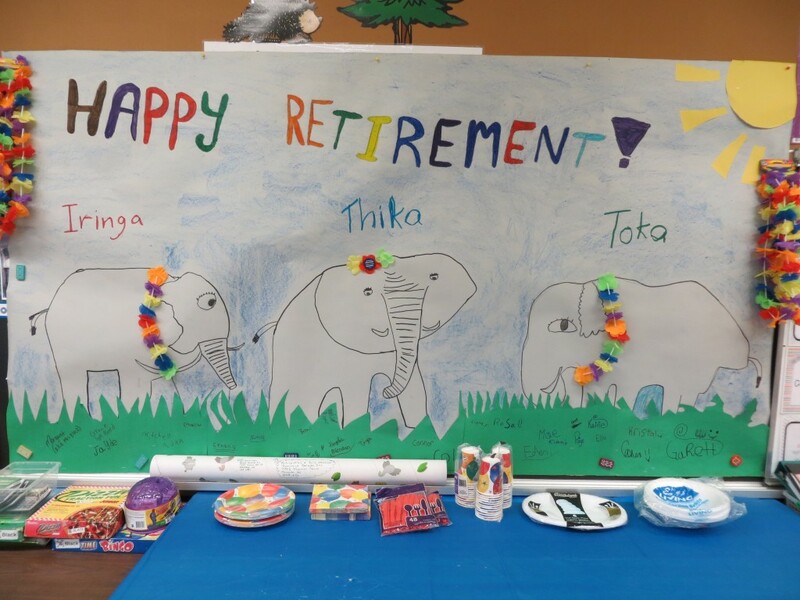 After the successful elephant transfer, students chose to apply an elephant retirement party theme to a class party they had earned via good behaviour. After the party, their beautiful elephant retirement mural was mailed to the Canadian charity that advocated for and organized the elephant move. As further follow-up, we are hoping to Skype with a representative of this organization, so students can ask the questions they have about the elephants and the logistics of their cross-country transfer. 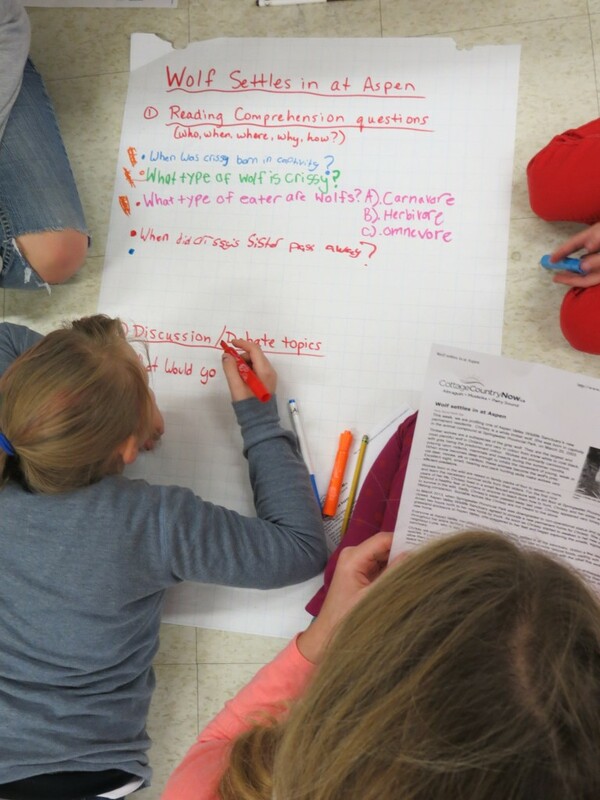 Students engaged in a reading comprehension/science project, brainstorming follow-up questions and discussion and debate topics to accompany short, educational newspaper articles, written by staff and volunteers at a local wildlife sanctuary. The class' ideas will be compiled and edited by two teachers and then uploaded to the sanctuary's website, as part of their free educational offerings for teachers. 4. SUPPORTING AN ILL STUDENT AT VICTORIA HARBOUR P.S. 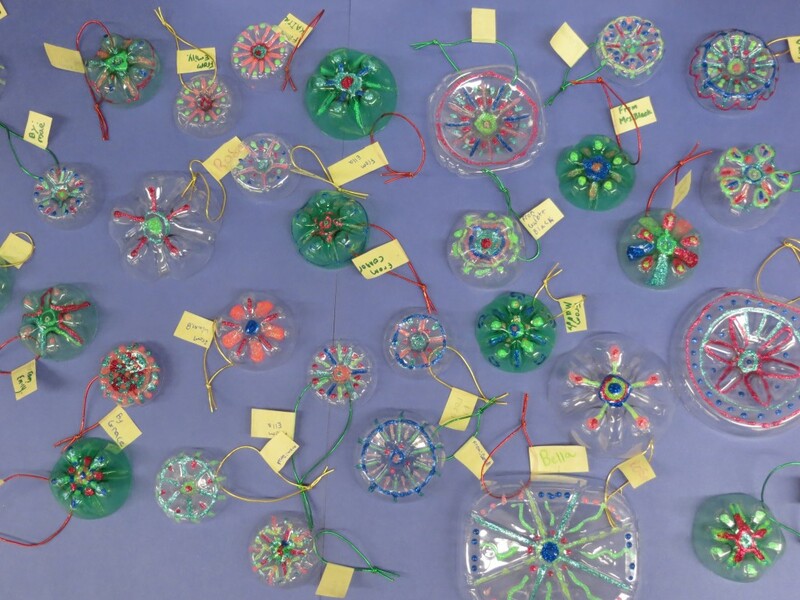 Our class responded to an appeal to send Christmas ornaments to an eight year old student at Victoria Harbour P.S. who has an inoperable brain tumour. We made beautiful snowflake ornaments for Rebeccah using pop bottle bottoms, glitter glue and shiny elastic. We hope our ornaments will brighten Rebeccah's day and show her how much others care. 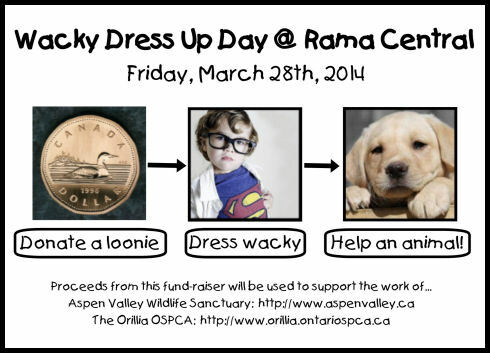 On Friday, March 28th our class hosted a "Wacky Dress Up Day" in support of The Orillia SPCA and Aspen Valley Wildlife Sanctuary. For a small donation, students in Kindergarten through Grade 8 were allowed to come to school for a day with wacky clothing and hair. 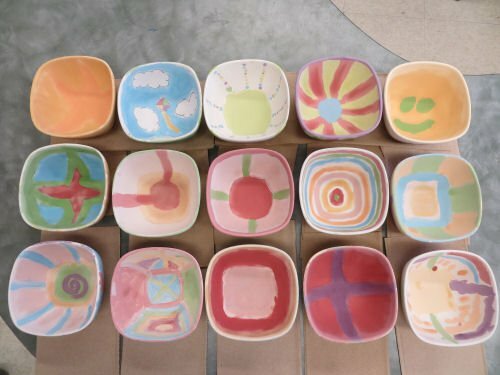 On Tuesday, April 1st, the Grade 5 students in our class and the Grade 5/6 students in Mr. Fitzgerald's class painted soup bowls to be used at Couchiching Jubilee House's upcoming soup-tasting fund raiser, in support of their transition house for homeless women and children. 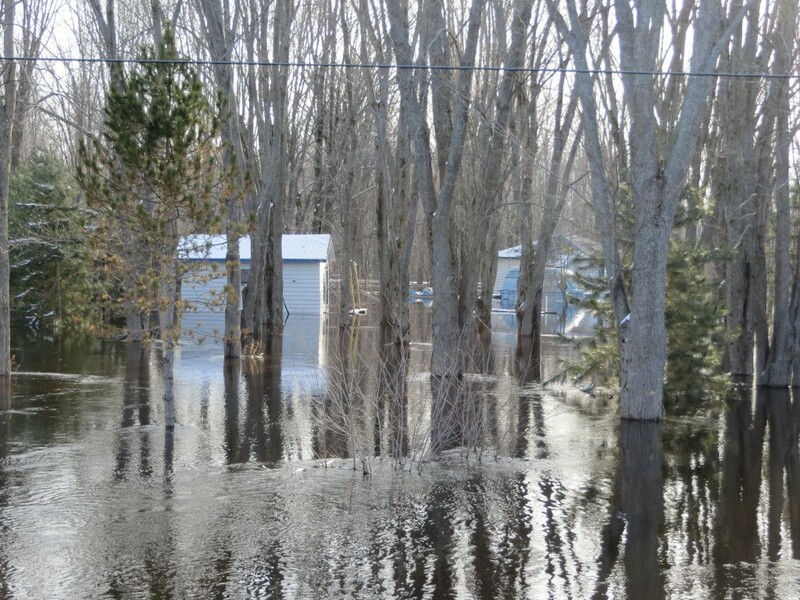 Toward the end of April, Grade 5-8 students at our school walked to the public works yard, two doors from the school, and filled about 1,500 sand bag that local residents used to protect their homes from unusually bad spring flooding. 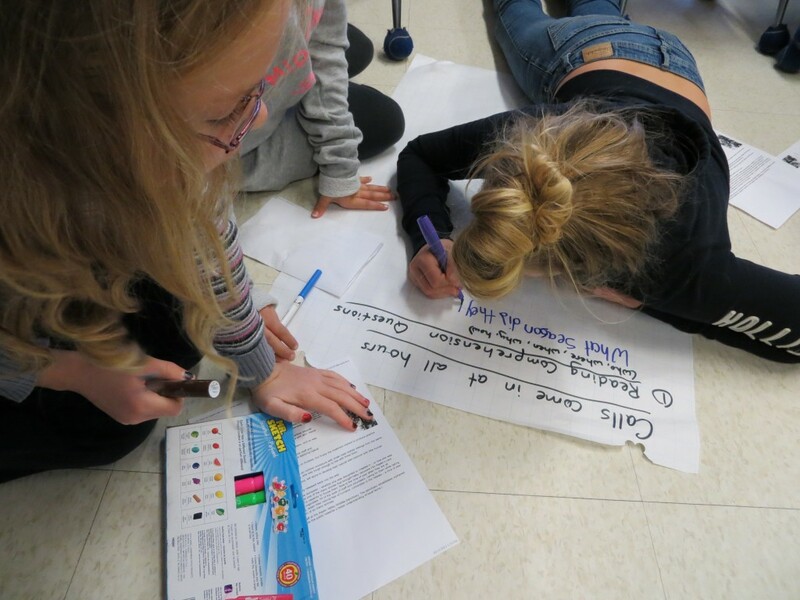 This year we are writing persuasive letters to companies, encouraging them to support the Kawartha Turtle Trauma Centre. The center, which is located in Peterborough, is currently the only rehabilitation center for turtles in Ontario. Each year, they treat over 1,000 injured turtles.